The early years of the Internet offered museums new possibilities for reaching broader audiences, and yet the anonymous character of most on-line interaction posed significant challenges for those who sought to foster a sense of community in the digital realm. In recent years, social media and other new tools have enabled museums to more successfully cultivate on-line relationships and even blur the lines between their physical and virtual communities. Borrowing terminology from German sociologist Ferdinand Tönnies, this paper uses the archetypal qualities inherent in traditional village life (Gemeinschaft) vs. life in big cities (Gesellschaft) as a framework for understanding museum approaches to on-line community. While the formally constrained (gesellschaft) expert-novice relationship that has so long been the paradigm for museums is still valued, we find compelling reasons to also explore the potential of gemeinschaft “whole person” interactions to change the nature of community relationships with museums. Using this framework, we review examples from the National Museum of American History and other museums using technology to foster community. Since the pioneering John Cotton Dana declared a century ago that museums should respond to, serve, and integrate into their communities, discussion has been ongoing about how best to achieve that aim. Simply defining a community can be a daunting task for some museums, let alone discovering and meeting the needs of its members. Typically, only a select few have had the privilege of exercising real influence and “ownership” over what happens in museums. Thus, while museums are generally highly valued by their communities, their impact could be heightened through true dialogue and mutual understanding with those whom they claim to serve. This paper will explore a framework for defining community and look at how NMAH and other museums have used technology to foster community by reshaping the relationship between museum and constituents. We will also assess some of the benefits, challenges, and limitations of this approach. Naturally we realize, as sociologists do, that real life is not so neatly segmented, though the pattern may ring true. For one thing, as people moved away from traditional family and community ties, they sought other ways to reclaim a sense of community. Sometimes sociologists call this neo-gemeinschaft (Bartle, 2004). Such communities can be made up of people with common interests or a shared sense of purpose. The rise of the Internet has greatly enabled these neo-gemeinschaft communities by giving people in disparate geographical locations more and greater ways to communicate and connect. Seen through this lens, could it be that the Web 2.0 phenomenon - all that blogging, sharing, rating, tagging, and status updating - has been an attempt to combat the impersonality, diffusion, and imposed structures of modern society? Does it fulfill a need to strengthen the degree of gemeinschaft in our daily lives? While the Internet already breaks down geographical barriers in amazing ways, such activities further erode social, hierarchical, and editorial barriers. We can see this happening in the entertainment and news media, politics, business - nearly everywhere we look. (Interestingly, other aspects of on-line communication, such as mobility, anonymity, and an element of meritocracy, take some characteristics of gesellschaft to new heights, creating a sort of hybrid of the two extremes - which is perhaps why the whole thing feels so new.) This style of interaction can influence our sense of belonging and bring a spirit of community to venues where none existed before. Younger generations, particularly, are embracing this approach (Jones and Fox, 2009). So where do museums come into this? The origin of many of our Great Museums is thoroughly intertwined with the history of industrialization and the growth of big cities. Indeed, some critics (going back at least to John Cotton Dana) fault museums for adopting and retaining too many of urbanization’s attendant gesellschaft qualities: impersonality, formality, and a tendency to segment those who care for and interpret cultural heritage from those who consume the experience that is provided. It can be argued that these large, urban museums set the tone for the field during the twentieth century, even as a wealth of smaller, local institutions blossomed and sometimes tried to break the mold. As an antidote, we are impressed with the gemeinschaft notion of “whole person” interaction and its potential to change the nature of community relationships with museums - just as it is redefining our relationships with other types of institutions and even individuals who we might have been acquainted with for years in a formal setting but who, thanks to Facebook or a blog, we now come to know in a more holistic way. This is all very good news for museums like ours - large, traditional, and without a strong community presence - that are trying to build relationships with our constituents by using Web 2.0 principles to develop and sustain a neo-gemeinschaft community. In the examples below, we will examine how both institutions and individuals within the institution can adopt a “whole person” approach. Some museums have attempted to foster a sense of community by introducing a greater degree of institutional openness in what we might call a “whole museum” approach. Such an approach embodies the qualities of a gemeinschaft-style “whole person” relationship and encourages visitors to relate to the museum in less formal, hierarchical, or transitory ways. One good example of this is the Indianapolis Museum of Art, whose much-discussed “IMA Dashboard” Web site (http://dashboard.imamuseum.org) makes the public privy to information that is not usually shared by museums in such an accessible format - everything from attendance figures to number of memberships to size of the endowment. IMA also takes the unusual step of openly discussing not just the “good” but also the “ugly,” including information about deaccessioned artworks and a sometimes-declining endowment. In his plenary address at a recent Museums and the Web conference, IMA director Maxwell Anderson (2009) shared his thoughts about how technology can allow museums to show a side of themselves that is “more sensuous, and personal, and behind the velvet rope.” According to Anderson, publishing standard images and information about our collections is “just a baseline, it's just the beginning of something.” Such basic information “is, for a lot of our visitors, not much different from the credits at a movie theater… something that's necessary, but not sufficient.” Instead, he encouraged museums to take “visitors to the movies instead of showing them the credits” by telling stories behind and about the objects, their context in history and in the life of the museum, and providing experiences that are, in his words, “tactile, sensual, and visceral.” Can digital technology, combined with a willingness to be more open and collaborative, be used to implement a “whole museum” approach that gives the public opportunities to relate to the museum with the kind of intimacy that Anderson is hoping for? At NMAH we have experimented with this approach in various ways. We regarded a recent two-year renovation as an opportunity to reach out and involve the public in the goings-on behind our walls while we were closed. During this period, we started our blog (http://blog.americanhistory.si.edu) which described the progress of construction and preparations for reopening, reached out on Facebook, and posted imagery on Flickr and YouTube. These outlets allowed us to share the work in progress and go behind-the-scenes with an ease and informality that was not available to us previously. A typical blog post from this time (http://blog.americanhistory.si.edu/osaycanyousee/2008/08/yes-we-really-d.html), about an aspect of the new Star-Spangled Banner gallery, spawned a question-and-response between a visitor and staff about a design detail, while another reader exclaimed, “Can't wait to see the room. We will be there at the end of Nov. The blogs are great!” In the past, such details would not have been deemed worthy to share with the public, and the museum would have missed an opportunity to interact in a way that was enriching to both visitors and staff. Our museum has also taken small steps to allow visitors to collaborate on interpretation of objects in the collection – or at least to include their thoughts next to the curators’. One example of this is on our on-line collection pages, where visitors can post comments or ask questions. This opportunity has great personal significance for some, such as one visitor who wrote to describe her family connection to a significant artifact (a colonial-era timber frame house from Ipswich, Mass. ), concluding with: “American history? This is my history!” (http://americanhistory.si.edu/collections/object.cfm?key=35&objkey=23). 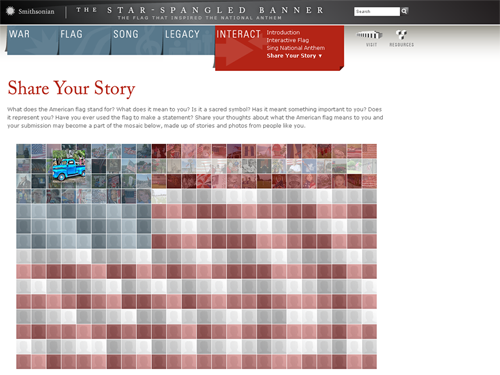 In another case, rather than lecturing to readers of the Star-Spangled Banner Web site about the variety of symbolic meanings that the flag holds for people, we encourage them to submit photos and stories via Flickr so they can share with us and others what the flag means to them (http://americanhistory.si.edu/starspangledbanner). These kinds of collaborations are currently limited to clearly-delineated parts of our site or to third-party sites. 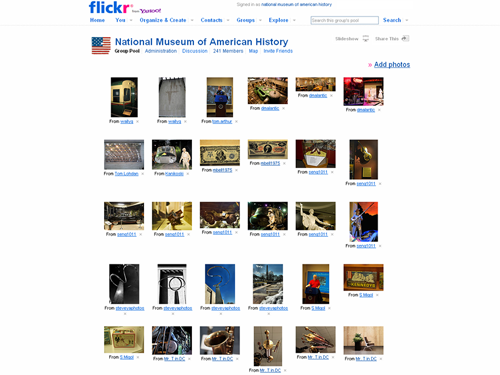 External sites like Flickr certainly offer cost-effective functionality, but possibly also feel “safer” because visitor-contributed content is segregated away from the museum’s core offerings. The full impact of this separation on attitudes is unclear, but we know that it can also benefit users by concentrating recent activity in a central location and making clear the authorship of specific pieces of content. A final example of “whole museum” interaction from NMAH is a rare case in which we invited the public to witness history in the making at the museum with cameras rolling. 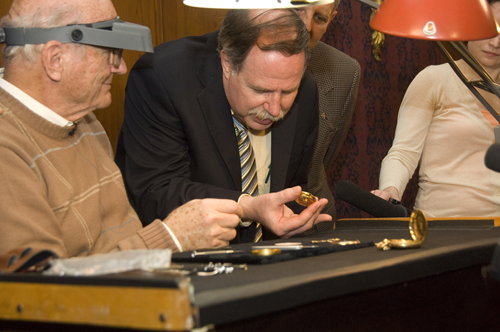 The event was the opening of Abraham Lincoln’s pocket watch, a prized relic, to ascertain the truth of a story about a watch repairman who allegedly made an inscription inside the watch upon hearing that the Civil War had begun at Fort Sumter. Inviting the public to share the experience was exciting, but risky. What if it revealed something controversial? What if there was nothing and we looked foolish? What if we broke the watch? In the end, an inscription was found that was different than expected and was somewhat difficult to decipher, leading to more questions and discussion about its authorship and meaning. The subsequent blog post (http://blog.americanhistory.si.edu/osaycanyousee/2009/03/a-hush-fell-over-the-room-as-the-watchmaker-halted-his-work-a-partially-dismantled-pocket-watch-that-once-belonged-to-pres.html) and YouTube video have been among the most popular posted by the museum. While we feel the museum is to be commended for allowing the public to witness an important moment at what is after all “their” national museum, we also neglected an opportunity afterwards to continue to service an engaged community. Blog comments with questions such as, “Are my eyes playing a trick or does it say ‘Jeff Davis’? Abv. for Jefferson Davis?? ?” went unanswered. Beyond making institutions appear more “human” and engaged in the community, we also see examples of individual staff members using the Internet to interact with non-staff in ways that go beyond (and complement) more traditional, strictly formal relationships. This includes revealing more about the work and the people that are normally hidden behind the scenes, but also involves reaching out to visitors themselves as “whole people” in an effort to understand their needs and engage them on multiple levels. For many museums, blogging has been a key way to achieve this kind of “whole person” interaction. On the IMA’s blog (http://www.imamuseum.org/blog), we learn from Associate Curator Sarah Green’s profile page that, in addition to an interest in post-national art and artists, she likes cooking, traveling, gardening, and sushi. On the NMAH blog, educator Megan Smith shares that her favorite museum object is the Greensboro lunch counter, because “it represents the possibility of change, and the influence that young people can have on our world” (http://blog.americanhistory.si.edu). 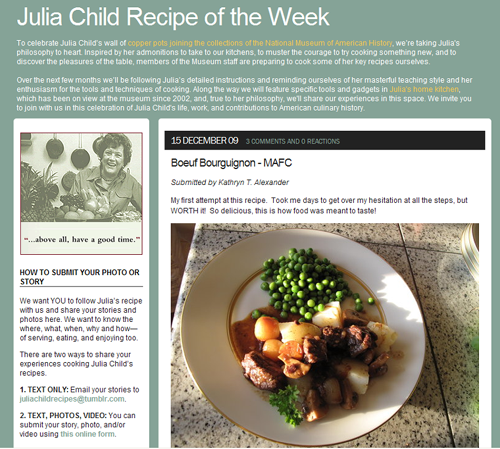 In 2009, NMAH took this approach a step further when we issued a series of 16 “Julia Child Recipe of the Week” blog posts (http://blog.americanhistory.si.edu/osaycanyousee/recipe-of-the-week-julia-child/) in honor of one of our most popular exhibits, Julia Child’s kitchen (which, not coincidentally, made an appearance in the summer film Julie & Julia). Each post was written by one or more museum staff members who tried a recipe of Julia’s and documented the experience – including mistakes – in a personal way. The blog series reflected the philosophy of the curatorial team that the best way to understand Julia Child is to follow “her admonitions to take to our kitchens, to muster the courage to try cooking something new, and to discover the pleasures of the table” – truly, a whole-person approach to learning that proved popular with our audience (http://blog.americanhistory.si.edu/ osaycanyousee/2009/08/do-try-this-at-home-reine-de-saba-cake.html). Together, the posts have attracted a disproportionate portion of page views received since the blog’s launch, and generated about 4 times as many comments as usual. More time and effort is needed to understand the effect that blogging and other less-formal staff interactions have on the public’s loyalty, engagement, and capacity to make meaning from the museum’s content. 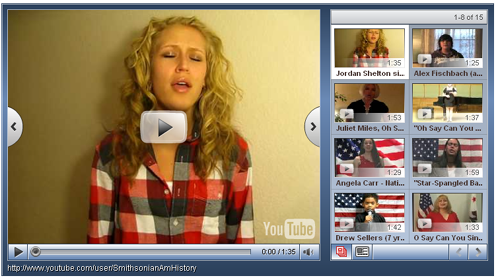 In another 2009 experiment, NMAH invited the public to sing the national anthem for us in a nationwide contest sponsored by USA WEEKEND magazine. 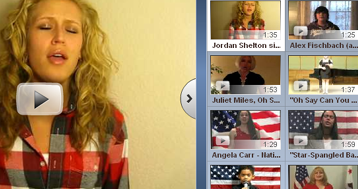 A diverse variety of more than 800 entrants submitted YouTube videos for the contest. The winner was invited to sing at the museum’s Flag Day festival, which included a naturalization ceremony (itself a model of “whole person” meaning-making), and a Baltimore Orioles baseball game (http://americanhistory.si.edu/starspangledbanner/sing-the-national-anthem.aspx). In this case it was our audience that was invited to share a piece of themselves with us (and others) and express themselves in ways that are not generally associated with a museum experience – let alone the Smithsonian. As in the case of the Julia Child project, the contest reinforced a key message of the exhibition that the Star-Spangled Banner (flag and anthem) “belongs to everyone.” We were pleased to see so many, both those who performed and those who rated and commented, share their passion, their enthusiasm, and their unique approach to the topic. We feel certain that direct or indirect exposure to the contest had a positive effect on the awareness and perception of the museum and one of its signature exhibitions; we might say it bestowed a new form of relevance for the museum in the national community. Other notable “whole person” efforts by museums to engage their communities include (but are certainly not limited to) the Historical Society of Pennsylvania’s “PhilaPlace” project to collaboratively document Philadelphia’s diverse neighborhoods (http://www.philaplace.org/); the Art Gallery of Ontario’s “This is my Neighbourhood” project pairing artists with students to create artwork that represents where they live (http://www.collectionx.museum /en/connection/4608.html); the Minnesota Historical Society’s “1968 Project” that invites the public to help tell the story of the year 1968 via a story database and film contest (http://www.mnhs.org/people/1968/); and the well-documented efforts of the Brooklyn Museum to engage its fans on many levels (http://www.brooklynmuseum.org/community/). For those who are using social media and other Web 2.0 methods to build a greater sense of community, there seems to be a shared sense of uncertainty as to whether or not these investments – particularly of time and attention – are successful, or what “success” even means. Most of us resort to counting what things we can count, and we take encouragement that for now, the trends are generally going up in terms of numbers of subscribers and level of activity in these new forms of communication. We may also bask in the 15 minutes of fame that the zeitgeist awards to us for trying something new or unusual. But are we having long-term, real effects on our constituents? Are we making our institutions more useful to the community, more loved, or more financially secure? In short, are our efforts well-placed? At NMAH, we see some indirect evidence that focusing on less-formal, “whole-person” interactions between museum and visitor does have an effect on outcomes – at least when it comes to satisfaction, arguably an important factor in self-directed learning. When NMAH re-opened to the public in November 2008, the museum introduced a new emphasis on “personal contacts” in its programming as part of a larger commitment to conversational interpretation that gives visitors the opportunity to interact, participate, and exchange ideas – and expertise – with the museum and each other. The goal was to have at least one-quarter of our visitors interact with a human interpreter, whether via a docent tour, gallery facilitator, interpretive cart, or historical re-enactor. This was an ambitious goal – amazingly, despite over 4 million visitors in the first year, we achieved it. Feedback to this approach has been overwhelmingly positive, as in this comment that one visitor posted along with a YouTube video shot during his visit: “The highlights were seeing Judy Garland's ruby slippers and seeing the Smithsonian volunteer – a nice retired lawyer – explain to us how the cotton gin was invented” (http://www.scottsravings.com/2009/12/day-in-dc.html). At roughly the same time, the Smithsonian hired a consultant to measure the satisfaction of our on-line visitors. They found that about 20% of Smithsonian site users interact with some form of social media during their visit (the survey question reads, “On this site today, did you use or view a blog, podcast, video, or other New Media or social media resource?”). This group rates satisfaction significantly higher than those who did not use these resources on the site during their visit. Then there are more specific cases where the public has responded (or not) to invitations to interact. It is a sign of our early understanding that, for us anyway, it is still somewhat hard to predict what will elicit a response. In 2009, the Julia Child blog series generated the most interest overall in terms of views and feedback. We anticipated that this would be a popular topic – was the subject matter itself the key to success, or did the style of interaction also play a role? Other posts that did well include the post on Lincoln’s watch; a piece asking readers to share their favorite historical fiction titles from childhood – this was a real sleeper hit (http://blog.americanhistory.si.edu/osaycanyousee/2009/09/my-tweenage-historical-bookshelf.html); and a reflection on the future of the museum’s digital presence (http://blog.americanhistory.si.edu/osaycanyousee/2009/07/the-future-of-digital-artifacts.html). While we are encouraged by these successes, other efforts to reach out and engage fall flat. Simply opening the door to interaction doesn’t guarantee a response. Just as life in a small village comes with its own challenges, so also does an attempt at “whole person” interaction for an institution. Not least of these challenges is the time that it takes to participate in the community by contributing, listening, and interacting. It is possible to use some of these communication channels with even limited amounts of time; Nina Simon (2008) and others have written about this. But we have found that making a substantial commitment to a new mode of communication, and not just the means, has required a larger investment. Fully participating in a community inherently requires a certain amount of “face time,” just as NMAH had to invest in human capital to achieve the goal of personal interaction in the physical space. Beyond creating the content and tracking the response, there is an administrative burden to coordinating the museum’s efforts. In our case this includes a cross-functional oversight committee that reviews content and meets regularly to set strategy. We face tough choices in how to allocate limited resources. What are the costs of spending our time this way? Are they worth it? How do we measure? Another challenge is that if your institution, like ours, is used to having a fairly tightly-controlled approach to communications, an open, “whole institution” approach can seem both risky and fragmented. A more honest and revealing mode of interaction may leave the museum looking a little less polished and expose individual staff members in ways that may feel uncomfortable. In the past, we rarely said anything as a museum until it had been thoroughly vetted by some combination of content authorities, editors, public relations staff, and management; opportunities for staff to speak as individuals were relatively rare and tightly controlled. The instantaneous, off-the-cuff, give-and-take of today’s on-line communication thrills some but seems downright dangerous to others (or maybe it’s thrilling because of the danger). Many staffers are accustomed to using the third person almost exclusively in their professional writing and scholarly discourse; this habit can make it difficult for them to see the benefits of putting forth more casual, first-person viewpoints in museum communications. As in the Lincoln watch example, it is easier to say nothing than to risk appearing unconsidered, speculative, or even unintentionally inaccurate. This tendency is strong at places like the Smithsonian that jealously guards the authority and reliability of its name brand. These complex issues of trust and institutional authority have been noted in the past (MacArthur, 2007). But the dynamics of a community brings its own form of shared ownership. Communities imply a degree of – if not quite equality – then at least co-dependence to keep them functioning. As in a village, everyone has a role to play regardless of “importance.” By putting ourselves in this relationship, we essentially sanction a forum where the audience gets to tell us what they think whether we like it or not, and we forfeit the right to control the space and what is said there. This was brought home for us in 2008 when our very first blog post drew a complaint from a visitor who was unhappy that the museum’s HAM radio station, which had been in operation for 32 years and had a small but enthusiastic following, was to be discontinued (http://blog.americanhistory.si.edu/osaycanyousee/2008/07/shedding-new--1.html). Since our comments are moderated, we passed it around internally and bit our nails while a decision was made about how to react. To our relief, the director (whose post drew the comment) allowed it to be published with a thoughtful response from him explaining the rationale. In another example, some entries to our Star-Spangled Banner singing contest drew a number of angry responses from traditionalists who felt that the national museum should know better than to allow singers to take artistic liberties with the anthem. In this case, a response was drafted and sent individually, though it could have made an interesting public discussion. Though such incidents have been relatively infrequent and self-contained, there is always the fear that some issue could snowball into the next Enola Gay debacle (Linenthal and Engelhardt, 1996); the speed and multiplying effect of the Internet certainly allow for that possibility. Optimists might argue that at least such participants are engaged and care deeply about issues that also matter to us. The modern popular imagination is rarely neutral about the virtues of small towns vs. big cities. Life in the country can be nostalgically delightful or dull and stifling; cities are portrayed as liberating and exciting or enervating and dystopian. However, when sociologists talk about gemeinschaft and gesellschaft, they are careful not to make value judgments about the superiority of one ideal over the other. Readers will likely agree that neither side of the comparative chart presented above has a corner on emotional appeal. In the words of one sociologist, “where a community has more gemeinschaft, it can be miserable to live in when everybody knows your business, where gossip is a strong force for keeping people in order, and where there is little freedom to act or dress in eccentric ways.” On the other hand, “where a community has more gesellschaft, it can be miserable being anonymous and without friends, where you are ignored most of the day, where you fear strangers who may hurt or steal from you, and where you are not sure what the laws are or if you might be arrested” (Bartle, 2004, Community Characteristics). Of course, each scenario has a flip side: some may prefer small communities where they are known by everyone and enjoy shared beliefs and values, and others may prefer the greater freedom and anonymity offered by the city. The key point, for sociologists, is that “We have to beware when people speak or write as if the community, in itself, is ideal. Some advocates of community participation write as if there is something intrinsic in a community which justifies its participation” (Bartle, 2004, Community Characteristics). Along these lines, it is easy to detect enthusiasm among museum Web advocates for the potential of Web 2.0 and social media to introduce a greater degree of gemeinschaft into a museum’s public interactions in the ways mentioned above. That implies a value judgment that less-structured, less-formal, more-collaborative and mutually-dependent relationships with our audiences are better. However, it is important to acknowledge that not everyone may feel that way, certainly among staff where it is sometimes seen as a threat, but also among the public. In various ways, our visitors and other constituents have told us that they are happy with a more structured, formal, authoritative relationship with the museum – at least some of the time or for certain purposes. In a 2003 survey of visitors to NMAH Web sites, when asked to rate their interest in various features, respondents expressed the most interest in conventional offerings such as timelines and other historical reference material, on-line collections, and virtual exhibitions, along with predictable choices like visit planning information, event calendar, and current news. Between 71-77 % ranked these features as “Very Important” or “Important.” In contrast, only about 40% expressed the same amount of interest in behind-the-scenes stories representing a more “whole person” approach. 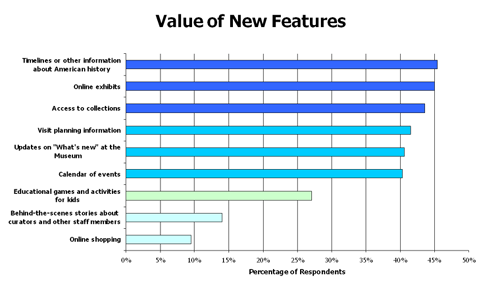 In 2007 the National Museum of Natural History conducted an audience research study that asked users to rate a variety of potential on-line features. Though they asked different questions, the outcome left a very similar impression to our earlier survey. Features tied to the authority of the museum, like “fun facts” and access to experts, received an 80-85 % favorability rating; community tools such as the ability to customize or contribute content, or see other users’ recommendations, were thought to be important by roughly 50% of the surveyed audience; while user-to-user discussion board interactions were only favored by 23 %. More recently, at NMAH we have been holding a serial conversation with our blog readers about various aspects of the museum’s digital future, and soliciting feedback by way of informal surveys and comments. Though unscientific, the findings have generally held true to the trends in the aforementioned audience surveys, even as Web 2.0 has gone mainstream. For example, when readers were asked whether the role of museums as trusted sources of on-line information would become more or less important in the digital age, nearly three-quarters thought it would become more important, 18% thought it would remain about the same, and only 9% thought it would become less important (http://blog.americanhistory.si.edu/osaycanyousee/2009/03/the-future-of-digital-history.html). In a question about whether the museum should focus on quality or quantity in prioritizing on-line collections efforts, the largest group (44%) felt that we should publish as many records as possible while ensuring their accuracy; another 26% held us to an even stricter editorial standard; while in contrast about 30% favored publishing everything regardless of its accuracy (http://blog.americanhistory.si.edu/osaycanyousee/2009/07/the-future-of-digital-artifacts.html). While these results can be read a number of different ways – and may not hold true at other museums – they seem to paint a picture in which we play a very specific, defined role for the majority of our audience: namely, as an on-demand source of reliable information about American history and material culture. It feels very gesellschaft. The engaged users who regularly read our blog, leave comments on our pages, contribute images to our Flickr groups, or act on our tweets is growing but still pales in comparison to the number who “lurk” or make use of our static Web pages. Collectively, we are a bit uncertain how to feel about this. How much effort should we put into this dedicated little band, and what might the long-term gains be (on both sides) as a result? Are we running up against some natural threshold of interest? Are we not adept enough at meeting users’ needs? Or do we have unrealistic expectations about how quickly visitors will adopt new methods? Perhaps quantitative measures like the number or percentage of people actively contributing aren’t even the right ones to focus on. Ross Mayfield’s “Power Law of Participation” concept suggests that even if a relatively few “power” users are making full use of the tools of participation, the benefits can extend to all members of an on-line community (MacArthur, 2007). SFMOMA’s response to this fact has reflected some uncertainty. Writing in 2007, Samis placed the burden squarely on museums to “alter visitor expectations by actively promoting innovative interpretive resources” and wait for a day in which “the printed word may lose some of its primacy, and technology use will feel more natural” (2007, The Digital Museum). More recently, Samis and Pau (2009) suggested a more cautious and conciliatory approach that “take[s] seriously our talk of meeting our visitors where they are – a process that . . . includes honoring, rather than discounting, the magnetic pull of time-honored museum-visiting habits – even if it means a net decrease in the presence of interactive educational technologies on the gallery floor.” Meanwhile, they have continued to experiment with these alternative methods since their evaluation shows that “Use of a greater number of interpretive resources correlates directly with enhanced meaning-making, greater appreciation of the artist, the exhibition, and the museum experience” (2007). This echoes the paradox in the Smithsonian’s own findings that while the number of visitors who use social media resources is relatively low, those who do so report higher levels of satisfaction. In summary, what conclusions can we draw from the ideas and examples presented here? In order to be effective community spaces, museums should foster a sense of communal “ownership” and encourage or allow a variety of activities that might seem tangential to their core educational mission. Listening to our constituents is key. Different museums may play different roles within their respective communities; even within a single museum’s community, users will have a variety of needs and prefer different modes of access. Sharing and collaborating on-line adds value for some users, and we should provide means for them to do so, recognizing that the benefits extend beyond just the relative few who directly participate. Others want “just the facts, ma’am,” and we can continue to fill that need. While judicious use of technology can support a “whole person” approach inside the museum, for now both museums and audiences appear to be comfortable conducting the bulk of this type of interaction on-line. (C)onsiderable research exists showing that visitors to museums are strongly influenced by the interactions and collaborations they have with individuals within their own social group. Research has also shown that the quality of interactions with others outside the visitor’s own social group – for example, museum explainers, guides, demonstrators, performers, or even other visitor groups – can make a profound difference in visitor meaning making. Whether in real-world or on-line communities, relationships are valued when they provide two-way opportunities for inspiration and fulfillment. The formal teacher-student, expert-novice (gesellschaft) relationship that has so long been the paradigm for museums is still valued. But we now recognize that this isn’t the only relationship model our audience expects, and it isn’t the only one that is valuable for both parties. We are just beginning to discover the benefits that a “whole person” approach can bring when visitors fully participate alongside the museum in a more closely-knit, gemeinschaft community. Dana, John Cotton (1999). The New Museum: Selected Writings of John Cotton Dana. (Ed.) William A. Peniston. Washington DC: American Association of Museums and Newark Museum Association. Falk, John H. and Lynn D. Dierking (2008). Enhancing Visitor Interaction and Learning with Mobile Technologies. In Digital Technologies and the Museum Experience. (Eds.) Loic Tallon and Kevin Walker. Lanham, MD: AltaMira Press. Greeley, Andrew M. (2002). “The Great Story and Its Discontents”. Society: Nov/Dec2002, Vol. 40 Issue 1, 45-48. Linenthal, Edward T. and Tom Engelhardt (Eds.) (1996). History Wars: The Enola Gay and Other Battles for the American Past. New York: Henry Holt and Company. MacArthur, Matthew (2007). “Can Museums Allow Online Users to Become Participants?” In Herminia Din and Phyllis Hecht(eds). The Digital Museum: A Think Guide. Washington, DC: The American Association of Museums Press, 57-66. Samis, Peter (2007). New Technologies as Part of a Comprehensive Interpretive Plan. In Herminia Din and Phyllis Hecht(eds). The Digital Museum: A Think Guide. Washington, DC: The American Association of Museums Press, 19-34. Wilkening, Susie and James Chung (2009). Life Stages of the Museum Visitor: Building Engagement Over a Lifetime. Washington, DC: The American Association of Museums Press.